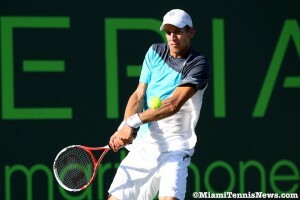 Jarkko Nieminen staged the comeback of the tournament thus far when he stunned David Nalbandian 2-6, 6-4, 6-3 in round one of the Sony Open Tennis event on Thursday afternoon. Niemined trailed by a set and two breaks at 3-0 in the second before a miracle recovery paced him to a win in one hour and 49 minutes. The 31-year-old Finn appeared to be on his way out of Miami when he double-faulted on break point already trailing 2-0 in set two. Nalbandian even had a game point on serve at 3-0, 40-30, but the turnaround began when his opponent managed to get one of the breaks back. From there Nieminen could do no wrong, surging through the second and using an early break in the third to clinch victory. Next up for Nieminen is fellow left-hander and No. 27 seed Martin Klizan. An even more intriguing second-round machup will pit world No. 3 Andy Murray against Bernard Tomic. The 20-year-old Aussie booked his spot in that showdown by dismissing 35-year-old qualifier Marc Gicquel 7-5, 7-6(3). Tomic twice fought back from a break down in the first set before both players held serve throughout the second. Gicquel also had a 2-0 lead in the ensuing tiebreaker, but Tomic won seven of the match’s final eight points. A style of play that did not work on Thursday evening was singles players on a doubles court. Top two Americans Sam Querrey and John Isner went down 6-4, 6-3 to Dominic Inglot and Indian Wells doubles runner-up Treat Huey. Inglot and Huey, former teammates at the University of Virginia, held all nine of their service games without facing a break point to advance in a mere 57 minutes. Up first for Isner in singles will be Ivan Dodig, who overcame Lukas Lacko 4-6, 6-0, 6-4. Additional three-setters on Thursday saw David Goffin oust Robin Haase and Simone Bolelli defeat Jesse Levine. Bolelli trailed by a break in the third and saved a match point on Levine’s serve at 5-4 before triumphing 4-6, 6-3, 7-6(4). Ricky Dimon is a contributor in Miami and writes for TennisTalk.com. You can follow him on Twitter under @RD_Tennistalk by clicking here. 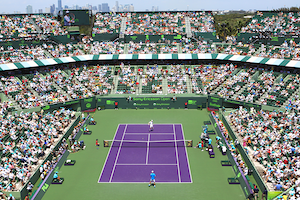 The Delray Beach International Tennis Championships singles’ draw has been released with American John Isner as the top seed. Isner faces compatriot Jessie Levine in the opening round while 2002 finalist and fourth seed Andy Roddick squares off against German Philipp Petzschner. At U.S. Clay Court Championships, Australian Lleyton Hewitt secured his first ATP title in over two years by beating 23 year-old American Wayne Odesnik 6-2, 7-5. For Odesnik ranked just outside the top 100, this was his first trip to an ATP final and on his best surface. As a two-time majors’ champion and former world number one, Hewitt used his wealth knowledge to pull him through. 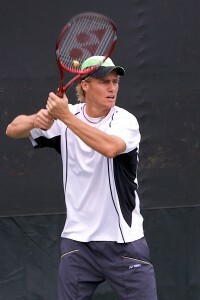 From the first point, Hewitt asserted himself with a forehand up the line winner. Then, with unforced errors from Odesnik , Hewitt went up 1-0. After consolidating the break, Hewitt connected on a forehand crosscourt winner for his second break chance and converted when Odesnik dumped his backhand into the net. However, with a double fault and unforced errors, Hewitt allowed Odesnik to get one of the breaks back for 3-1. In the next game, Hewitt had another advantage point courtesy of an inside out forehand winner. But, Odesnik brushed that aside with his own forehand winner and with a great backhand volley pickup saved the game. Subsequently, Hewitt opened the door for Odesnik with another double fault and a forehand shank. But, with two aces, Hewitt wiped off double break point, preventing his opponent from leveling the set. The Australian then sealed a third break to take the set 6-2. Odesnik started the second set as he had the first. Multiple errors handed Hewitt a double break lead at 3-0 despite the Australian only getting 31% of his first serves in play. In the fourth game though, Odesnik capitalized on double faults by Hewitt for 1-3. After a marathon nine-deuce game in which Odesnik saved four break points to hold for 2-3, the American got a rare backhand error from the Australian to square the set at 3-3. In trouble again at 15-40, Odesnik came up with a few clutch serves to force return errors from Hewitt. After, with a backhand up the line winner, Odesnik had his first lead in the match at 4-3. With Hewitt’s backhand temporarily AWOL, Odesnik won five straight game for 5-3. Regrettably, serving for the set, Odesnik’s most reliable shot, the forehand went on holiday. As a result, Odesnik was unable to recover from triple break point. After easily equalizing the set at 5-5, Hewitt forced one too many forehand errors from Odesnik to get the upper hand at 6-5. Thereafter, despite serving a double fault, Hewitt regrouped to capture the championship. By reaching the finals, both men will incur a significant bump in their ranking. On Saturday, in the doubles final, Bob and Mike Bryan thumped fellow Americans Ryan Sweeting and Jessie Levine 6-2, 6-1 for their fourth title of 2009.